Advance stop line rumble strips (ASLRS) are grooved strips placed upstream of a stop-controlled intersection. Advance stop line rumble strips (Shutterstock). Advance stop line rumble strips (ASLRS) (also called transverse rumble strips or in-lane rumble strips) are grooved strips placed upstream of a stop-controlled intersection. ASLRS are transverse to the direction of travel and provide an audible and tactile warning to the drivers. Placement and design of ASLRS is covered in the Iowa DOT Design Manual, Chapter 6, 6A-7 (Iowa DOT 2014a) and the Iowa DOT Traffic and Safety Manual, Chapter 18, 18A (Iowa DOT 2014b). 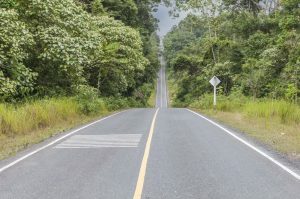 It is suggested that rumble strips should not be added to reconstruction or resurfacing projects that do not involve geometric changes or changes in stop conditions unless the Office of Traffic and Safety requests them. It is also recommended that rumble strips only be placed on approaches with a speed limit of 55 miles per hour (mph) or more. Several studies have evaluated the effectiveness of ASLRS. One study used intersections from Iowa and Minnesota. The table below summarizes the studies where crash reductions were found. Other studies are summarized in a tech brief (see below). More information is provided in this technical brief, Advance Stop Line Rumble Strips (PDF), which summarizes information about ASLRS relevant to Iowa. Iowa DOT. 2014a. Iowa DOT Design Manual, Chapter 6, 6A-7. www.iowadot.gov/design/dmanual/manual.html?reload. Iowa DOT. 2014b. Iowa DOT Traffic and Safety Manual, Chapter 18, 18A. Office of Traffic and Safety, Iowa Departement of Transportation.